Parts required, big things first. Throttle Body – eBay purchase history doesn’t go back far enough for me to see what I paid for it, and I don’t have any pictures of it, but I have the throttle body from a big ATV, a Kawasaki if I recall correctly, with a bore very similar to the 30/31 PICT carburetor and more importantly, a similar horsepower rating to a stock 1600. This should make it pretty easy to adapt and install to the stock manifold, so… check! EFI controller – I have the MicroSquirt version of the MegaSquirt II controller. The original plan was to exchange the MicroSquirt for the MSII on the Dragon Trike and use that unit for Sponge Bob. That may still be a good plan. The MicroSquirt is a smaller, weathertight controller with some motorsport friendly features, like built-in hardware for either two-coil wasted spark ignition or even coil-on-plug for four cylinders, etc… check! Fuel system modifications – EFI requires a high pressure fuel pump, a regulator and return to the fuel tank. 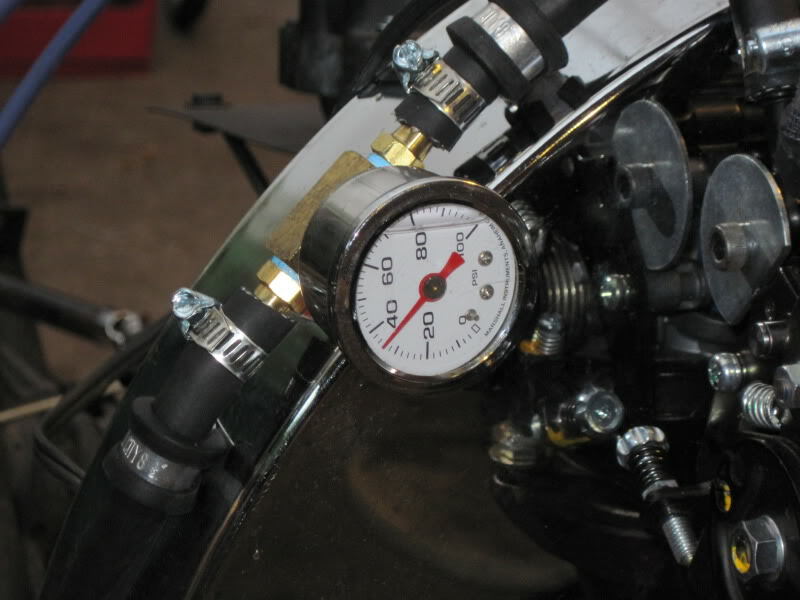 Motorcycles, with their really short distance from the tank to the engine, can generally get away with the pump, regulator and return all being inside the tank, with a single regulated high pressure fuel line going to the throttle body. Because of the way Sponge Bob’s fuel tank is mounted directly above the engine and carburetor, that would work pretty well here, too. The tank, however, would need quite a bit of work to make that work. It is currently just a plain cylindrical tank with a little tap on the bottom of it. The question becomes, do I figure a way to use it as is, modify it or replace it? Replacement becomes a decent option because places like Pacific Customs make fuel tanks to order. Rebuilt engine – Admittedly a rather big item, but I don’t think it’s wise to expend all the effort required to install and tune EFI on an engine that needs rebuilding. This engine should be properly in tune and running perfectly on a carburetor before the switch to EFI begins. The current engine has a freakin’ welded on crank pulley and keeps only most of its oil between changes. It seems likely that I have missed pretty much all of the mild spring season for working on the trike. It’s so stupidly close to an actual stopping point that I feel like a bum for having not finished it yet. Between an especially rainy spring and a pretty major remodeling project in the house, followed quickly by a long-planned vacation trip, I find myself at a point of nearly being ready to take up the reins again and get this thing permanently on the road. The big thing left is the replacement of the shifter. I have a dune buggy shifter that I need to install. It will be slightly tricky because I need to preserve the current mounting attitude and position, and yet replace the current shifter with one of a completely different design. I have a cunning plan. 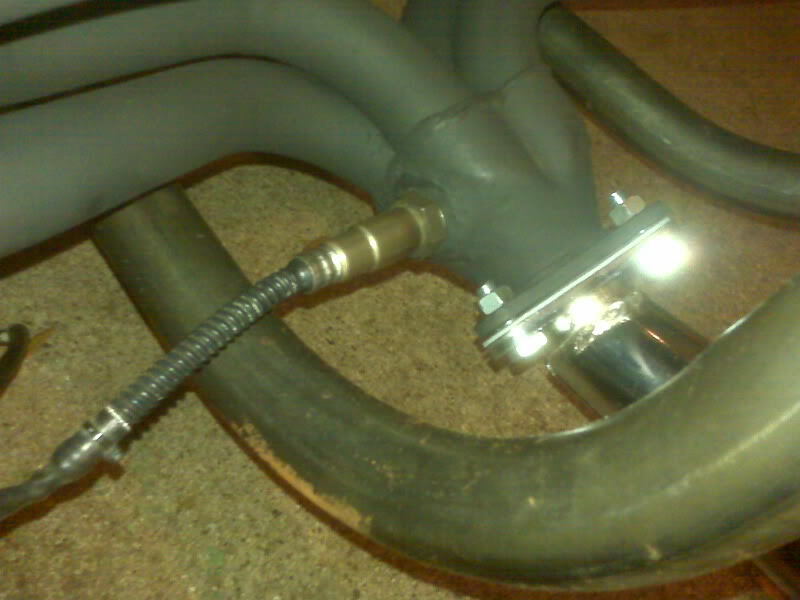 After the shifter is in place, the trike will be rideable and thus tunable. It was an eventful day, tuning wise. First, I found that the serial cable extender had come loose regardless of the almost heroic efforts to prevent it. After that, I found that I was getting no usable signal from the LC-1. A bit of quick troubleshooting showed that the controller itself appeared to be working. I connected (semi-permanently) the LC-1 LED output to an LED on the speedometer/dash. It indicated error code 2, which is a bad heater circuit. I was able to locate a sensor at a nearby O’Reilly Autoparts (O’Reilly part number 17014, in case somebody needs that) for $52. It’s working correctly now. On the way to the parts store, I suddenly remembered that I wanted to verify the actual Bosch part number against the information I had looked up. It is indeed the Bosch sensor part ending “7057”. Perhaps more importantly, though, I discovered physical damage to the sensor that I had not noticed when I removed it. Upon further investigation, the baja bumper has not yet been pinned to it’s lower mounts after all the clutch work. I think when I was towing the trike around, the bumper hit the ground and was pushed upward where it struck the sensor. So, gotta pin that bumper down so it won’t cost me $52 every time I have to tow it somewhere. So, with the EGO sensor working, I was able to get a little observable EGO correction to take place. I’m sure I need to tweak some parameters. It seems to react slowly, which is probably not a bad thing overall, but it also doesn’t seem able to dial in the target AFR. It gets pretty close, just not there. I presume there is some other enrichment factors in force and will need to find them. I spent the most time trying to dial in some usable acceleration enrichment. While the trike has been drivable and throttle response while under way is decent, it stumbles pretty badly right off idle. It’s kind of like the infamous dead spot these engines experience when equipped with the ubiquitous Bosch 009 distributor, a unit with centrifugal advance. There are a few of people running these distributors that are very happy with them. For racing applications, the engine is either idling or running WOT, so the stumble isn’t a big deal. For the street, these distributors can be tuned with the appropriate springs so that the advance is full on at a fairly low RPM, which largely eliminates the flat spot, but it’s always at least somewhat there, ranging from minor annoyance to killing you when you try to pull out onto a busy street. Armed with this background knowledge, I spent a couple hours today trying to tune in the spark advance table. First, I verified that the trigger offset of zero is appropriate for my EDIS ignition system with a timing light. Dead on. Then I tried scaling the table because the values in it seemed low across the board. With the 009 distributor, for example, one sets the idle timing to be about 7 degrees BTDC and by the time the engine is spinning, it’s running 28-30 degrees. So, I scaled my spark advance table to correspond with that. Well, the first minor thing is that the nature of the EDIS module is that 10 degrees BTDC is the least advance it will allow. By having a lower number in the table, it made the *displayed* advance dither around in the 7-9 territory without affecting the actual timing at all. I manually moved all the lowest values up to 10 degrees. After than, it seemed to be adjusting ignition timing pretty much as I would expect it to need, but the stumble was still full on, so I started looking at fuel. Armed with a working EGO gauge, I was able to tell almost immediately that it went just about dead lean on acceleration, sometimes as high 22. I tweaked on the acceleration wizard and was able to get a pretty nice rev out of it. I was not able to make much progress on MAP based acceleration. Seems whenever I had any percentage of control as MAP, I could not satisfy whatever basic settings it wanted and I couldn’t keep it running. So, with all TPS based numbers, I was able to rev the engine nicely, so long as I wasn’t extremely gentle. Then I started playing with EGO correction again and somehow lost the rev. As it sits now, Accel Enrichment is pegged at 100% and never responds to TPS input. I am reading a lot…. The trike has been intermittently road worthy. It spent a LONG time sitting after some clutch trauma that I thought was going to be much much worse. It’s drivable enough to do a little shakedown cruising in a big parking lot…. 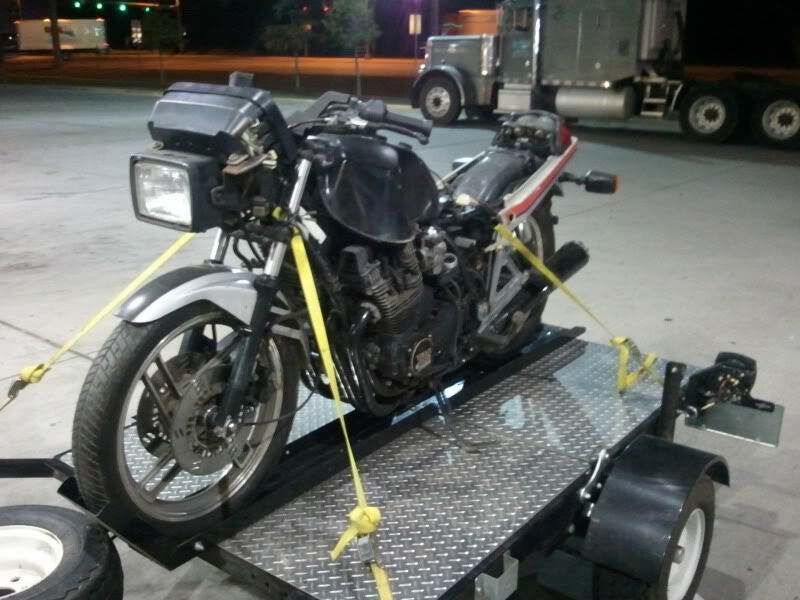 But, Buzz’s sale helped finance what I’m sure will eventually be another MegaSquirt project, a 1982 Yamaha Seca Turbo. In the mean time, I am still working on my VW Trike. I resolved a mechanical issue with the clutch, so I will have it on the road enough to seriously pursue tuning. There has been little engine work because I need the trike on the road first, and while I did have it on the road briefly, the transaxle exploded, so it’s back in the driveway. I will be getting a replacement transaxle and I hope to have the trike back on the road by this weekend. In the 15 or so miles I managed to put on it before *that* happened, it ran tolerably. I had troubles getting the IAC stepper to be consistent, so warmup is kinda manual. Once warmed, it has a flat spot off idle, which I kind of expected, but it pulls pretty hard up to about 3000 RPM, where it feels like it leans out. For a set of pretty much default tables, it seems to run ok. Obviously, I will still be tuning on it, but it is drivable now. Well, except for the transaxle sounding like ice cubes in a blender. Anyone interested in the rest of the build, including lots of pictures, can check out the build at the build blog. I have tomorrow off work and because of the other trike work being done, I am nearly ready to put this thing on the road and get an inspection sticker! The surgey idle I was experiencing during my last log capture may have been a result of unnoticed fuel starvation. Yep, it was outta gas. Though I have not seen any normal evidence of a leak, while I was rerouting the fuel line, I noticed that the bottom of the tank was wet with fuel. Turns out there is another tiny pinhole. I applied some of that emergency gas tank repair epoxy stuff on it. Tuesday evening, I got to play rescue ranger for a friend who’s dying battery had stranded him. When I got back, I didn’t do much on the trike, not really wanting to do the 15-20 minutes of preparation I generally need to get started when I was only had an hour or so total. I did replace the throttle spring on the yellow trike with a lighter pull spring. I have not yet ridden it with the new spring, but it seems like it will work well and significantly reduce throttle hand fatigue, which is a big issue on that one. I use a cramp buster, but I rest the heel of my hand on it and still have press down to maintain highway speeds. Last night I took a little video of the engine running with a Canon compact digital. The sound and picture are way better than the Blackberry video, taken in the dark with sound apparently set to “extra crappy”, and the new one has no irritating narration. I also did some work on the handlebars, needed to begin wiring the chassis and body, and I mounted a fuel pressure gauge. Tonight I have a prior commitment, but tomorrow morning, I pick up the body with new upholstery! With all these pieces coming together this week, I hope to be able to take it around the block sometime this weekend, at which time I can really begin to tune on the engine. Speaking of tuning, I heard back from SpeedTek about the dyno thing. The 6-pulls-in-2-hours deal has to be scheduled well in advance. At any given time, they need 2-3 weeks lead time since the pretty much dedicate a technician for 2 hours. There is a chance I may be able to get on the schedule for the week of my vacation in June, but I will probably wait till after that. I found SpeedTek, which is reasonably close to home, has several dyno pull packages, including the “Solo Power Pass”, which is basically 6 pulls in 2 hours with owner tuning time between pulls, for $100. I have sent an email asking about dyno testing a trike. As for the log, what I know how to interpret looks good. Shrug…. The most obvious “problem” is the MAP pulsing. Standard deviation (assuming that is the right statistical tool) is 3.18 for a 15 second period of idling. The MAP needle on the MegaTune gauge jiggles, as do values tied to it, like injection pulsewidth and X-Tau correction and ignition advance. I think it might be easier to tune if this signal is smoothed out some. At this point, the vacuum signal is taken from one throttle body, which feeds two cylinders. There appears to be only one non-ported vacuum port on the one TB. There are two other vacuum fittings, presumed to be ported, but I will T them together and see what that signal looks like to MegaSquirt. As a testament to the cooling ability of the air blower, CLT was sitting at 180F after the engine had been sitting for a couple of minutes while I started the log. From the time the engine started until the temperature stabilized at 145F was just 60 seconds, much of it at idle or gentle reving. If water had the same drop, it would go from a cool springtime rain to ice cubes in 60 seconds, so that’s no small bit of cooling. I did a bit of reading today and have a better understanding of the tuning procedure. In my previous project, I think the throttle body was so oversized that even basic tuning was essentially unobtainable. In this setup, however, it actually responds to my commands… or at least it’s amenable to some of my suggestions, if it’s not too much trouble. I loaded the last msq from last night and tweaked on the Injector Control, then reloaded and tweaked on the VE table, then reloaded and tweaked on the Ignition Advance, each seeing what effect I could have. Oh, and tonight the O2 sensor seems to have regained it’s sanity. I don’t know why it went insane, nor do I know why it regained sanity. That worries me, but for now, I’m happy about it. In the condition it’s in now, it idles pretty good, though my nose says it’s kinda rich. It revs very nicely. It was complete sputtersville last night. It was lean and massively backfiring below 4000 RPM, but now my testicles retract when the tach gauge in MegaSquirt turns yellow and I see 5400. Of course, reving in the driveway and running down the street are largely different loads, and it will be a while before I can get on the street and start tuning for a load. I wonder how much dyno time would run?